I’ve been to a majority of Microtel’s hotels in the Philippines. But I’m always left surprised every time I stay in a property that I’ve never tried yet. At first glance, I thought that Microtel Cabanatuan looked simple, just basing on its subtle, orange façade. But as soon as I entered the inn, I found myself uttering the word, “Wow!”. Microtel Cabanatuan instantly became a favorite, as I compared it to all the other properties that I’ve stayed in (though Microtel Baguio still tops my list!). With its warm, tropical-inspired and spacious interiors, I instantly knew that I would have a memorable experience here. I felt like a legit VIP the very moment I stepped inside the hotel (located in the quaint community of Sta. Arcadia), as we were ushered in by Microtel’s friendly staff. The pleasantly cold and spacious lobby, which was complemented with earthy tones, was adorned with classy paintings and newspaper clippings about Microtel’s North Luzon properties (Tarlac, Cabanatuan and Baguio). We actually arrived late, and were already behind schedule. So as soon as we arrived, the charming receptionists immediately handed our key cards. We only had enough time to drop our bags, freshen up, and take some pictures before leaving the hotel to see the city. Coming home to Microtel Cabanatuan was a welcome respite, especially after a long day of exploring Nueva Ecija. The hotel's warm interiors made me want to just stay in all day. More so, when you've got a gorgeous pool just right outside your window. My friends and I have been raving about it all day, and have already planned on doing an evening dip right after dinner. 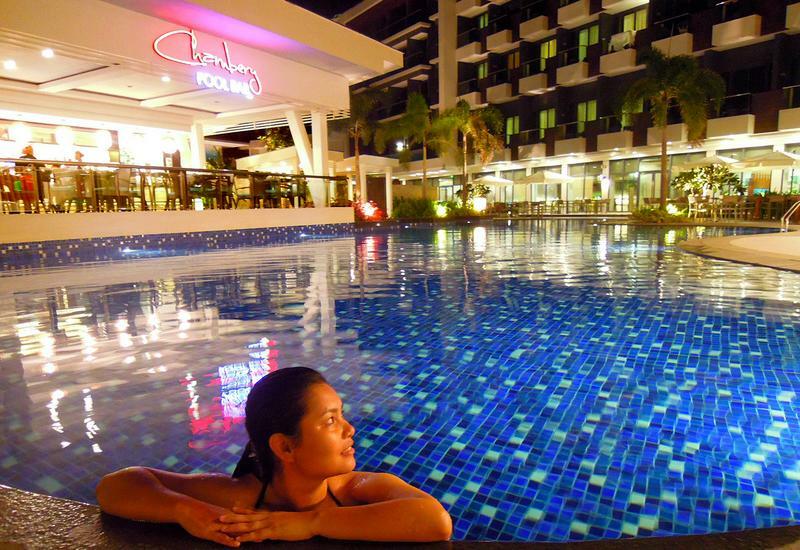 I honestly love the sight of pools, and the one in Microtel Cabanatuan was a definite stunner, particularly at night. The yellow-orange glow from the spotlights that illuminated the walls of the lodgings and the chest-deep swimming pool, exuded a somewhat enthralling and romantic vibe. I wasn’t supposed to swim with my friends because it became a bit chilly that night due to a heavy downpour. But they all urged me to take a dip, as it was surprisingly warm. Since there were no machines used to warm the pool water, my friends worked up a theory that the earth might have stored enough heat to warm it. Regardless of the reason, we all enjoyed a relaxing bath, amidst each other’s company. We would've stayed longer if not for the 10 PM restriction. But the nice staff at reception allowed us to stay for an extra 30 minutes. One of the things that I look forward to when staying in a Microtel hotel is their chiropractor-approved mattresses. Not only are their beds good for sore backs like mine, their Queen-size beds are also very comfy and quite large (ideal for two guests). But of course, if I can hog the bed all to myself, then better! Kidding aside, the pillows provided were, as always, soft, and the covers fresh and clean-smelling. There were also some additional items in the room that I found useful like the landline phone, alarm clock, and cabinet. Of course, my all-time favorite would be the window seat in the room. I also enjoyed taking a long and hot bath under the rainshower head of our roomy bathroom. Good thing a lot of my basic needs were also at arms reach, like fresh towels, newly stocked soap and shampoo, and a hair dryer. But what else is in store for you when you stay in Microtel Cabanatuan? Aside from the wireless Internet access and complimentary buffet breakfast, you’ll also be provided with free-flowing coffee and drinking water at the lobby. I definitely loved the company of the Microtel Team who took us around several parts of Nueva Ecija (special mention to Ms. Lita and Ms. Belle, and our hardworking drivers). Despite the heat and the endless transfers, they were always all-smiles, and were very accommodating of our needs. Thank you to Sir Roy as well, for making sure we were well taken care of all throughout our trip. Despite the hotel being situated in one of the hottest regions in the country, the warmth of the people who welcomed us, and the fascinating sites that we got to explore with them, reminded me of how remarkable of a place it is. Microtel Cabanatuan is definitely a destination worth experiencing and more! Microtel Cabanatuan can also take you around the city, or in any part of Nueva Ecija. Their very accommodating team can even take you as far as Minalungao National Park, all the way to Fort Magsaysay (where the Aquino-Diokno Memorial is located). Should you wish to explore these nearby sites, don't hesitate to inquire about their rates and schedules. Check out the places that we visited HERE. Cabanatuan City is 3.5 hours away by car from Manila. From North Luzon Expressway (NLEX), take the Sta. Rita (Guiguinto) exit. Turn right on Maharlika Highway, then go straight. Turn right on Lakewood Avenue, turn left on Vergara Highway, and then turn right on Mabini Extension Road. The hotel is on the left. *Shuttle service within Cabanatuan City is free from 7 AM to 11 PM (prior reservation required).